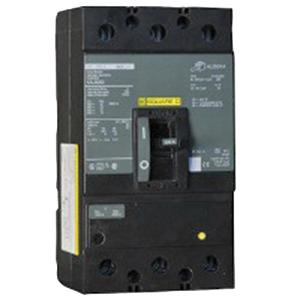 Square D Type KA standard 3-Pole molded case circuit breaker is rated at 250-Amps and 600-Volt AC. Interrupt current rating of this circuit breaker is 25-Kilo-Amps at 480-Volts. It measures 4.5-Inch x 4.75-Inch x 8-Inch. This 3-Phase K-frame circuit breaker accommodates one copper/aluminum wire of size 4-AWG - 350-KCMIL. This circuit breaker features thermal-magnetic trip function to ensure reliability. This HACR rated circuit breaker supports plug-in mounting. It is suitable for use with I-Line panelboards and switchboards. Molded case circuit breaker is UL listed, CSA certified and meets IEC standards.